Documentarians capture the world and preserve it in some form for the future. They may also be championing a cause that they wish to broadcast to the masses or spotlighting an injustice they want the world to see, but ultimately they are creating an archive of what is or has happened that will remain as long as the medium of film remains playable by subsequent generations. As a result, documentary filmmaking frequently interacts with photography, its primary predecessor, and films about creative photography tend to be particularly poignant, as one of this year’s Oscar nominees for Best Documentary inarguably is. 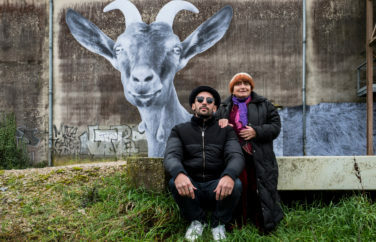 Director Agnes Varda, a prominent participant in the French New Wave film movement, teams up with photographer slash street artist JR to travel through rural France. As part of JR’s Inside Out Project, they take photographs of people after learning their stories and then blow them up to paste them in a significant location, like the image of a farmer on a building he and anyone who visits sees every day. The eighty-nine-year-old filmmaker and the thirty-year-old photographer both share a passion for meeting people with interesting backgrounds and helping them to truly see themselves, and they also discover quite a bit about each other and how they see the world differently in the process. This film really is best likened to a film version of a photo essay, since Varda and JR set out to explore a landscape with which they have some familiarity and to understand the people who inhabit it. Their purpose is to see people in new ways and to capture the feelings and emotions that they express upon being shown these portraits. It’s an exceptional journey, one that sparkles with creativity and a delightful energy, with each person interviewed perfectly willing to talk freely and be open to something they would never have imagined. The power of these large photographic murals being put up is difficult to convey, and that is the number one reason to watch this film. 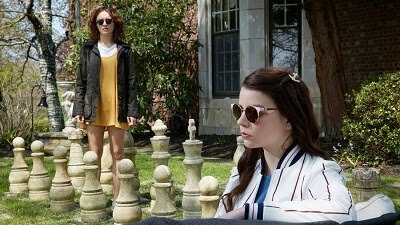 But the relationship that develops between Varda and JR is a very close second, since they’re also trying to open each other’s minds to fresh ideas, like JR wanting Varda to stop harping on how old she is and how each meeting might be her last and Varda pressing JR to remove his token sunglasses for just one photograph. This is film that’s easy to love, representing a more optimistic but equally compelling vision of photography and its power from the last great Oscar-nominated documentary of its kind, “The Salt of the Earth.” There’s simply so much to see here, and Varda and JR have done a wonderful job of capturing it.